I have been really getting into making home-made pizzas recently. Home-made pizzas are incredibly easy (especially if you buy pre-made dough) and infinitely healthier than your average pizzeria pizzas. I could make the dough myself, and it is not hard if time consuming, but I have been using Trader Joe‘s pizza dough, which is very affordable (99¢ for a dough ball big enough for two 12″ thin crust pizzas), convenient and very tasty. Once you have the pizza dough ready, sky is the limit for the topping. The most difficult part of making home-made pizza is exercising the restraint not to load too much topping (too much topping makes soggy pizza). The other key to crispy thin-crust Italian-style pizza is the pizza stone, as your oven is never going to be as hot as the wood fired pizzeria brick ovens, which reaches the temperature well north of 500 degrees of most domestic ovens. By pre-heating the pizza stone in the oven at the highest temperature setting that your oven allows, you are mimicking some of the surface and heat effects of the real pizza ovens. As for stretching the pizza dough, you don’t have to go crazy like those pizzaioli in competition by throwing it in the air and such. I start making the dough into a ball, then flatten it into a disk and start stretching it from the center by turning it around your fist. The dough is pretty resilient, so you can be pretty aggressive. I stretch it until I can almost see through the dough, but leave a little lip on the edge. Another tricky part in making pizza is transferring the dough to the super hot pizza stone. If you have a pizza paddle, you can flour the paddle generously and slide it onto the stone, but who has a pizza paddle at home? The back of cookie sheet will do the job, but I like really thin pizzas, and I found the cookie sheet is not ideal for this job. I find that using parchment paper works well in terms of easy of transfer without sacrificing the crispiness. 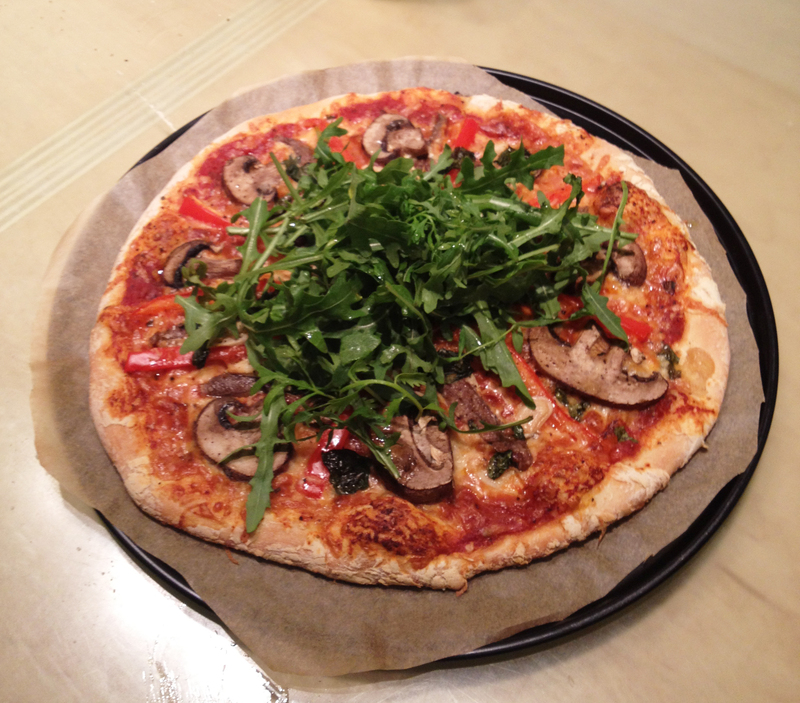 This entry was posted in Recipes and tagged arugula, easy pizza recipe, Imo's Pizza, mushroom, mushroom pizza, pizza, vegetarian. Bookmark the permalink.